has a very mixed legacy, for better or for worse. As the date of Scottish Independence Referendum draws closer (breathe, Pearl, breathe…..), it is timely for us to take another look at the historic conflict and the larger implications it has for us today. This June 24th marked the 699th anniversary of Robert the Bruce's decisive victory over the forces of Edward II, preserving Scottish independence from England. Indeed, unlike the Jacobite Rebellions this is one of the instances when “England vs. Scotland” is used properly in the context of warfare in the British Isles. Well, relatively properly at least, considering that so much of the fighting in the 14th Century had more to do with king than country. But in truth, the courage and dedication of the Scottish freedom fighters did preserve the freedom of the Scots (even if the main benefits were only applicable to the nobility) who otherwise would have been reduced to a subjugated people under the thumb of the English kings. 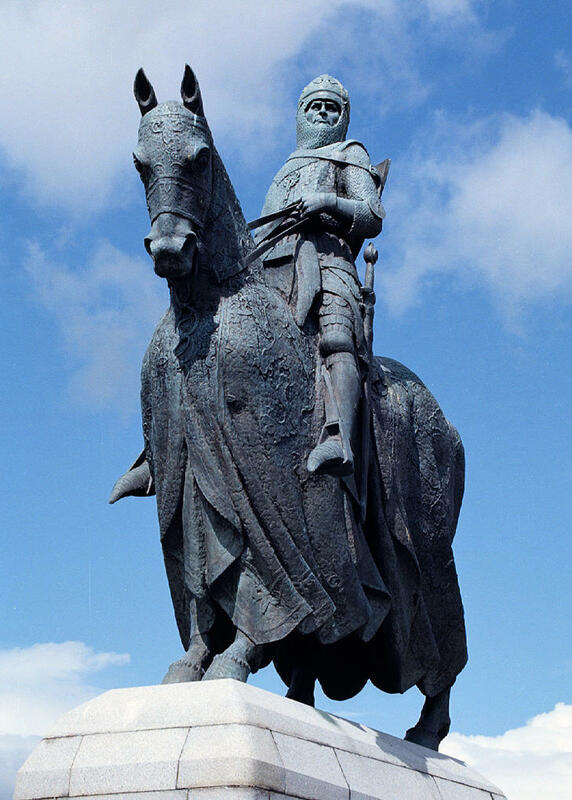 Even though there is a great deal of mythology intertwined with history in the story of Bannockburn, I can also appreciate the fact that the most potent myths are almost always initiated by a germ of powerful truth. The fact that the Norman noble of Scotland beat the Norman nobles of England, and drove them south of what historically was a frequently-shifting border, has come to instill a sense of independence among the Scots; and just as Robin Hood and King Arthur symbolize resistance to tyrants so now does Robert de Bruce, in spite of all his own personal issues and the lack of personal freedoms for many in medieval times. In spite of the different elements of the time, the Wars of Scottish Independence seem to have served as a “first step” on the road to national identity for the Scots, just as the Hundred Years’ War tended to bolster the national identities of the English and French. The men under Robert de Bruce called themselves people “of the lion”, for lack of a proper definition of the “thing” they were fighting for. However, they seemed to know they were fighting for a new sort of “thing” nonetheless. If anything, they knew they weren’t English, as many Scots today will be only too eager to reiterate! In a round-about way, I actually see Bannockburn as being a significant moment for Unionism, certainly worth celebrating, since the Scots fought tooth and nail to prevent becoming the subjects of the English, and Scotland never allowed itself to be taken by storm and reduced to a colony. When the England and Scotland eventually came together it was through mutual consent – but without Bannockburn, perhaps things would have been different. And yes, even though the famous Arbroath Declaration was certainly not “democracy” as we know it, neither was Magna Charta or any medieval document. It had its good points, though, and is worth quoting on the right occasion. In essence, I can appreciate Bannockburn in its historical and legendary context, and I can understand if the Scottish people would like to celebrate the upcoming anniversary with street parties and fireworks and the like. Unfortunately anything can be taken too far, and that is just what is being suggested. There’s no doubt that the song has an infectious tune that stirs the blood, and I personally have no problem with the first verse of the anthem, which basically just recounts the courage of the Scots at Bannockburn who repulsed the English army from their native soil “to think again.” However, things go downhill from there. Listening to the rendition by the Clancy Brothers and Robbie O’Connell in their album “Older but No Wiser” (profound title…), I can’t help but grit my teeth at the blatant misrepresentation of the current state of Scotland depicted in the second and third verses of the song. Is Scotland really a “land that is lost now”? And why is it necessary for the Scots to “rise now, and be the nation again” that defeated the English all those years ago? In 1707 the countries of England and Scotland were brought together and formed into the Kingdom of Great Britain through mutual consent (the presence of corruption being greatly blown out of proportion by some historians), and both were represented in the Westminster Parliament as they are today. Granted, there were sometimes pushes to dilute the traditional identities of Englishness and Scottishness in the early days of the Union, and for a time the terms “North Britain” and “South Britain” came into use (up until the early 20th Century, in some cases). But the Scots and English were in no way ready to abandon their cultures, and Scotland and England remained distinct even after being merged. As I have surmised in previous articles, I believe that the beginning of the distaste for the British identity among Scots began when the Empire began to crumble. Traditional patriotism became hopelessly associated with the worst kind of pompous nationalism, and many of the Scots decided to back-track rather than face up to their mistakes and move on. Shifting the blame and associating themselves with the conquered rather than the conquerors became a protective shield. “We’re Scots, not Brits. We want our own parliament. We want independence.” It proved to be a slippery slope. And here we are today, almost one year away from a referendum that will determine whether the United Kingdom will remain true to her name. Ironically, just one year after the 700th anniversary of the Battle of Bannockburn in 2014 (which the Nationalists hope will coincide with Scotland’s “independence”), the Battle of Waterloo will be remembered on its 200th anniversary in 2015. Waterloo was one of the most important battles in world history, where the English and the Scots fought together under the Union Jack helped defeat Napoleon, a tyrant far worse than King Edward II of Bannockburn infamy ever was. Logically, this conflict should be a source of pride for all Britons and should gain far more publicity than the medieval Battle of Bannockburn. But some people seem to have tragic tunnel vision. All the hyper-active rantings and white-washing only does a disservice to all the brave Scots who proved themselves to be loyal Britons since 1707. And sent him homeward to think again? Your sons were dying to make the nations free! * First verse written and general pattern created by Roy Williamson; next three stanzas written by Pearl of Tyburn. The Scots may say Bannockburn, but we say Culloden because it’s not the heats that counts, it’s the final. Ive just finished digesting your OU article on Bannockburn, great work! In particular I liked your analysis of "Flower of Scotland" and I agree with your rejection of the latter verses, which seem to attempt to create a sensation of loss or grievance. As a scot myself, I would say that the modern Scots identity is in places somewhat hollow. Most Scots, in my experience, are quite ignorant of their wonderful history. (as an example, in my early high school years, I did a project on William Wallace and no-one else in my year had ever heard of him. It was only later, when our History got the distorting Hollywood treatment, that any widespread awareness of Wallace began). For me this poverty of identity is mainly due to the protestant reformation which, in an identity sense, represented a kind of "year zero" in that the reformers attempted to destroy, hide or erase the previous 1500-odd years of Catholic Scotland. The majority of Scots cultural icons from this period - architecture, artwork and the like - were maliciously destroyed in the reformation. Now the Scots can only ponder the (still magnificent) ruins of monasteries and cathedrals, while their equivalents elsewhere in Europe still function today. It is sad to think that those responsible for this destruction have produced literally nothing to take the place of what they wrecked. And, now that Scottish Presbyterianism has largely fallen by the wayside (and will probably pass into history during this century), you can see that the Scots are left with nothing. The odd part is that many attempt to portray the reformation as a positive or noble event - in reality it was largely born of greed and self-advancement. For example, where I grew up is called "monklands" because historically Catholic monks worked and maintained the lands. But at the reformation, the abbot became a protestant and simply took the lands for himself (base theft). Talk about a "get rich quick" scheme. Scots should swell with pride at these kinds of events, but they do not, because they are of Catholic Scotland and so they are not discussed. Post reformation Scotland was founded on the notion that Catholicism = bad, and so many people struggle to see anything pre-reformation in a positive light. This gives rise to certain ironies - eg those who resent the Catholic Churchs ongoing role in Scottish education make fools of themselves, as it was the Church which first brought education for ordinary people to the nation. But the critics are ignorant of their ignorance. So, rather than by these important historical events, many Scots today instead define themselves by what they dislike - be it the English, or the Catholics. Many Scots think resenting these groups is what it means to be Scottish - its very sad. This kind of negative, or inverse identity is a phenomenon I have not encountered elsewhere. I think in part this "negative identity" explains the sentiments behind Flower of Scotland - rather than pride in our own nation, our anthem is all about who we dislike and how hard-done-by we feel. The end result of all this is an ignorant and divided society. Most people have no real sense of themselves and are simply unthinking clients of cheap, imported pop culture. And that which is thought of as being genuinely Scottish (kilts etc) is in the main a modern and contrived caricature of an identity. Let us hope that one day Scots can become aware of, and proud of, the fullness of their history and identity once again.